As part of XOXO After Dark’s Thriller Week, we’re delighted to welcome New York Times bestselling author J.A. Jance to our pages! J.A. 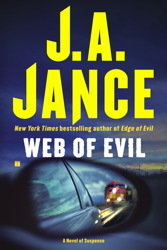 Jance is the author of dozens of bestselling suspense novels, including the Joanna Brady series, the J.P. Beaumont series, and the Ali Reynolds series. So obviously, she’s the perfect author to talk about writing series characters! We hope you enjoy it, and check out any of her terrific sleuths. Here’s to Deadly Stakes, which happens to be Ali Reynolds #8, now out in paperback. When I’m looking for a new author, I’m always a little leery when the tag line says Something or other #6. Or in the case of this summer’s Second Watch, Beaumont # 21. That means there’s a lot of history there before the book I’m holding in my hand. The dilemma is do I want to start out with the most recent book in a long standing series or do I want to start at the beginning? If I start here, won’t I feel lost? Won’t I be confused or miss out on some of the story? That’s how I feel as a potential reader. As an author, however, I’m looking at this situation from the opposite side of the page, as it were. Starting the process of writing a new book in an established series is a lot like walking a tightrope. In the opening chapters, as I introduce characters, I have to do so in a way that will appeal to both brand new readers and longtime fans as well. I have to make sure that I include enough of my ongoing characters’ background so new readers will feel as though they’ve had a “complete book.” But I can’t include so much of the “old” stuff that my longtime readers will be bored to tears. Believe me, finding the right mix isn’t always easy. When I was first making the transition from original paperback to hardback, I had two publishers and two editors. The first publisher and their editor were happy to sell my books and me as “genre fiction.” The second editor suffered from a severe case of delusions of literary grandeur. She wanted my books to be “literary fiction.” I thought my mysteries were . . . well . . .mysteries. It was not a good mix. The editor and I didn’t blend. Somewhere in the editorial process we had a long discussion in which she told me that I had to explain how my detective got his fortune; how his good friend, Ron, ended up in a wheelchair; what happened to his the detective’s second wife–and his first wife, too, for that matter. I said, in a word, N-O!!! I wanted people to feel compelled to go back to those early books, which were and ARE still in print, and learn the answers for themselves. By reading books. Even if those books were, as the editor told me, “only original paperbacks.” By the way, I’m still earning royalties from those early books where people are still going looking for answers to those same questions. I saw the cover of that first hardback Beaumont book before it was published and I approved of it. What I didn’t see was the three-inch-in-diameter gold stamp that would be affixed to each cover that said, “Meet Judy Jance.” That wasn’t even my proper pen name. I’ve been J.A. Jance from the beginning. Grrr! That book wasn’t my first rodeo. The hardback in question was my actually my eleventh published novel even though the first nine were original paperbacks! Let’s just say my tenure with that editor was short but brief. So welcome to Ali #8, Deadly Stakes. If you’ve never read an Ali book before, no problem. There will be enough of the back story included in the book that you should feel at home. That’s not to say there won’t be some unanswered questions when you finish. Where did Leland Brooks come from? Is B. for real and is B. his real name? (Yes and yes!) The answers to those questions and many others will be found in the previous books. If you love Ali # 8, you may want to go back to Edge of Evil and read the books in order from the beginning. Or, if you’re an up-the-down-staircase type person you can go back in time one book at a time and learn about Ali’s history in reverse. I’ve met a few compulsive type readers who have gone through my entire body of work–almost fifty books in four separate series–in something less than three months. (These people do not have a life!) If you’re that kind of reader and LOVE Deadly Stakes, you’ll be caught up in no time and you’ll be first in line for the next one. (By the way, Ali # 9, Moving Target, is due out in February.) Or you may want to wander off the reservation and try one of the books featuring one of my other sets of characters. So feel free to love Ali or hate her, but please, if it turns out that Ali is a character who is not your cup of tea, feel free to walk away–no harm; no foul. Vote with your feet and with your pocketbook. Don’t buy another one, but spare us both the agony of your sitting down, wasting your time and mine, by writing and firing off what I call an e-mal (That’s not a typo. An e-mal is an e-mail with bad vibes!) to tell me how much you hated the book and how and why I should have and could have written it better. Fifty times in the last thirty years I have sat down to write a book. I have written each one to the very best of my ability. Believe me when I tell you, I like some of my own books better than I like others, too. If you’re new to my books, don’t expect to find any superheroes. If my characters fall in love, they tend to get married. And have kids. My cops are people first and law enforcement officers second, or at least they try to be. Or as in J.P. Beaumont’s case, learn to be. I had an editor who told me once that Joanna Brady shouldn’t marry Butch Dixon because it would be boring. That was eight books ago, and their lives still don’t seem boring to me. My experience with marital relations is pretty much 50/50, but good or bad, marriage is NOT boring. It’s complicated. Actually, I need to change that from 50/50. If I were better at math, I’d be able to say 55/45 in favor of husband number two. I’ve now spent 28 years with my second husband (Definitely GOOD!) as opposed to 18 years with my first one (definitely BAD!) The good one has given me almost three decades of happy if complicated times and the bad one gave me three decades of material to write murder mysteries about, so maybe he wasn’t THAT bad, either. Given all of the above, if you think Ali Reynolds, and by extension, J.A. Jance, are people you’d like to meet, welcome aboard! By the way, if you do want to reach me, my address is jajance@me.com. I always answer my own mail. Cranky e-mals tend to slip to the bottom of the list. In this “heart-stopping” (Publishers Weekly) page-turner from New York Times bestselling author J.A. Jance, Ali Reynolds finds herself working against the police to clear two innocent names. Arizona heats up when Ali Reynolds' ex-husband is found dead in the trunk of a car...and Ali's the prime suspect! When Sheriff Joanna Brady finds herself--and her daughter--embroiled in a murder investigation, she may learn more than she ever wanted to know. The ghosts of J.P. Beaumont's past haunt him...or are they trying to tell him something? The first in NYT bestseller J.A. Jance's J.P Beaumont series! Beaumont is determined to avenge a little girl's death--even if he risks his life to do it. A J.P. Beaumont novella from NYT bestseller J.A. Jance, available in both print and e-formats--a perfect stocking stuffer for your mystery fan! Your books have moved me to tears in some instances and made me laugh out loud in others. I’ve read everything that I found under your name at the local libraries and bought the newer ones when I’ve seen them on the shelf. They always entertain.